It was an across-the-board $3-per-ton decline for the all-hay, alfalfa hay, and other hay June average hay prices, according to USDA’s most recent Agricultural Prices report released last week. This was the first month-to-month drop since last January. The all-hay price was $143 per ton, which still remains $9 higher than June 2016. Hay other than alfalfa averaged $124 per ton in June, $8 per ton ahead of June 2016. The alfalfa hay June price was $152 per ton, $10 per ton over the 2016 level. 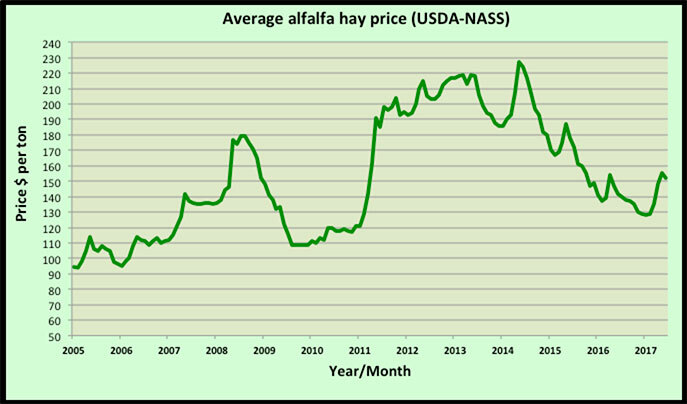 The alfalfa price remains $24 above the low of $128 per ton set in January. It is not atypical to see a price decline in June from the previous month. In fact, during the past 10 years, there has never been a June alfalfa price increase relative to May and only once was it the same. The USDA price averages account for all qualities of hay sold and the final U.S. estimate is a volume-weighted average rather than a simple average of state values. Those states with the most volume sales will impact the final U.S. dollar value more than those states with fewer sales. The leading alfalfa price gainers in June were drought-stricken North Dakota (plus $45 per ton), Washington (plus $30), Ohio (plus $15), and South Dakota (plus $15). New York saw a price drop of minus $28, followed by Pennsylvania (minus $15), and Missouri (minus $10). The highest alfalfa hay prices are being reported from New York ($222 per ton), Kentucky ($210 per ton), Texas ($190 per ton), and New Mexico ($185 per ton). 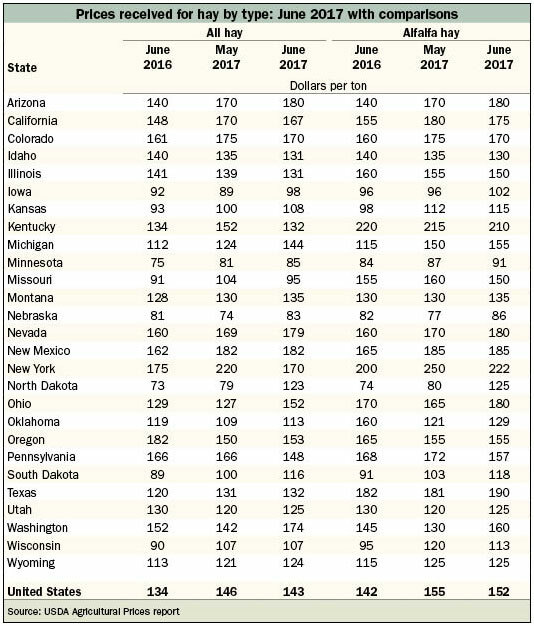 The lowest prices can be found in Nebraska ($86 per ton), Minnesota ($91 per ton), and Iowa ($102 per ton).